A married couple move back to his childhood village to start a family but a surprise visit from the husband's brother ignites sibling rivalry and exposes the lies embedded in the couple's relationship. An evocative, beautifully shot drama that examines the fragile relationship between truth, intimacy and betrayal. Wreckers is the evocative, beautifully shot debut feature from British director D.R. Hood that examines the fragile relationship between truth, intimacy and betrayal. It features standout performances from British acting talent Benedict Cumberbatch (War Horse, Tinker Tailor Soldier Spy, BBC's Sherlock Holmes), Claire Foy (BBC's Little Dorrit and Channel 4's The Promise) and Shaun Evans (Endeavour, The Take). Director Hood was nominated for the Best Newcomer Award at the 2011 London Film Festival, at which her film premiered. 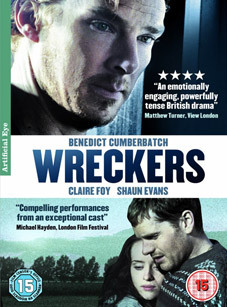 Wreckers will be released on UK DVD on 19th March by Artificial Eye at the RRP of £15.99.